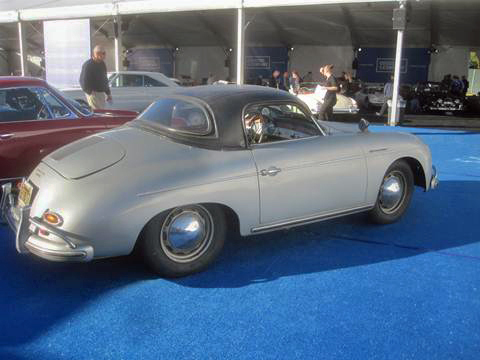 As winter tightened its grip in New England, the Collector Car Auctions in Scottsdale looked like the place to be. Weather in the 70’s, lots of sun, and thousands of cars crossing the auction block. With our names on the list at Barrett – Jackson, R M Auctions, Russo and Steele, and Gooding and Co., son Rob, and I made a clean sweep of it. 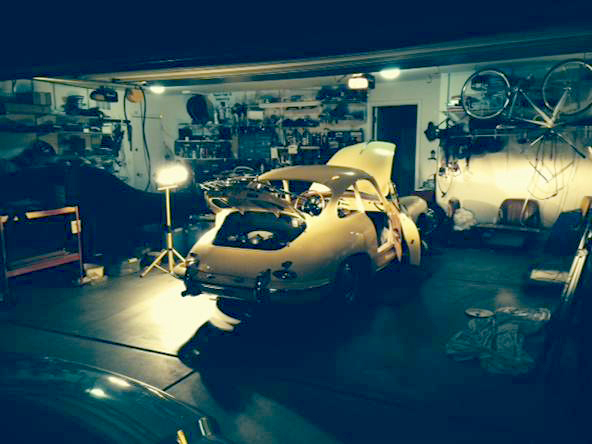 I flew in a day early to help with the reassembly of a ’65 356SC coupe that Rob had in his garage in Goodyear, AZ. He had found the car in CA, in a strange shade of beige-gray and had decided to have his painter take it back to its original Champagne Yellow, a terrific color on these tubs. 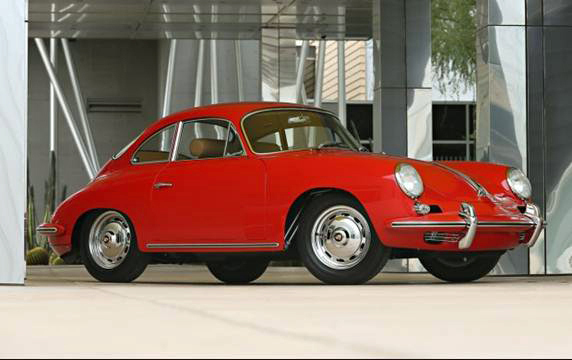 Because of the prices that Porsches are bringing in todays market, every auction house had a long list of cars from Stuttgart. 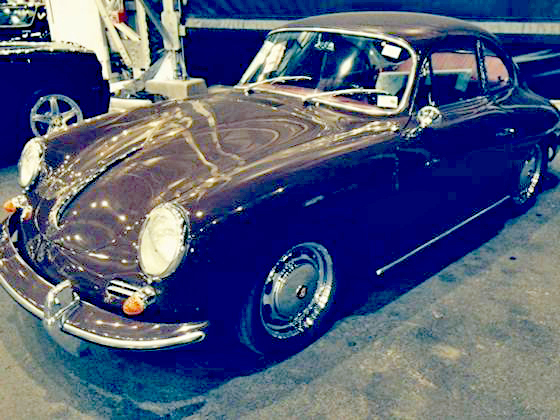 Even the big muscle car venue that started it all, Barrett – Jackson, had a ’64 356 in Togo Brown. For us it was a spoiler with a red interior but even with that combination it brought $110k from a bidder and went to a new home. There were some bargains to be seen. The very first car across the block at the Bonham auction was a very nice ’72 911T in black which looked terrific but bidding stopped at $65k. I think people were just finding their seats and it was gone before they could find their paddles. Russo Steele was a huge surprise with a ’57 Speedster that didn’t show up on the website or in the catalog and had just been finished by a well known shop in CA. I really couldn’t find any flaws in the work but it only made it to $260k before it changed hands. Compare that with the barn find at Gooding above that needed everything and sold for almost double that figure. Wrong venue, wrong crowd, I just can’t account for the difference. They also had a ’74 Euro 911 Carrera with 58k on it, owned by a sheik, in brown and looked like new, totally original that went for $275k. That was about a 30% discount to the market value. Attempting to get more imports into the mix, two Audi R8’s were sold cheap, one V10 Cab rolled for $110k. There was a lot of talk that the market wasn’t meeting expectations and it wasn’t as the estimates that were posted in the catalogs were seldom exceeded. I would suggest that some of those numbers must have come right out of a phone book, as they had never been seen on a Porsche before. As an example, R M Auction was looking for $175k-$225k for a Champagne Yellow, ’64 356SC sunroof coupe that only reached $159k. Only? That’s the biggest number I’ve ever seen on a coupe, sunroof or not. That even raised Rob’s expectations on his project. After all, it’s the same color, it must be worth as much, right? The $242k paid for a ’65 356SC Cab was a huge jump in value from just a couple of years ago when those models were selling for $120k. Early 911 prices seem to be on track for another 40% year and those are even raising the prices of 911SC that everyone has been avoiding the last few years. There were some models that were not represented at all. Nobody listed a 914, and the 924/944 models were nonexistent. My guess is that was for the same reason that there were just about no MGs or Triumphs. There’s just no money to be made there. Since the auction houses charge the sellers 10% and the buyers 10% (yes, that’s 20%) there is just no reason to sell $10k cars when the lots can be filled with $50-$100k cars. After all, they can’t pay the bills by just selling $3 bottles of water in the vendor area. 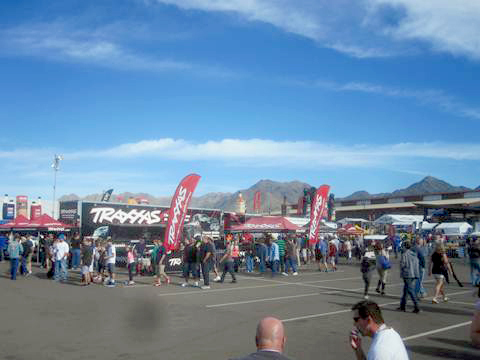 By far the largest site was the Barrett – Jackson show. 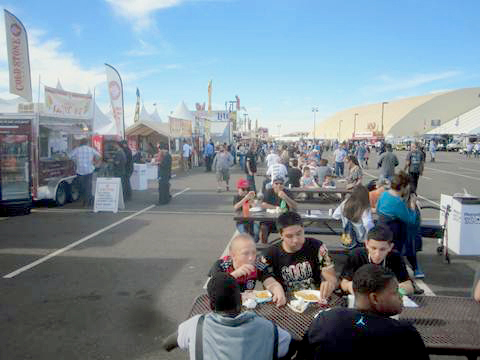 There had to be at least 30 food vendors alone, all fried, of course. The layout had been changed since last year to allow for more outdoor displays. Boats and small planes had been added to the mix. Thrill rides in Mustang 500GTs and Dodge Hellcats were smoking up the pavement as the pros chased each other around on a new short course with fans in the passenger seat. It was exactly like a state fair but without the animals. There were a few surprises that we just don’t see back East, at least I haven’t seen it. There is a very large following of folks that are into early Toyota Land Cruisers. With 33” tires and rows of LED lights on the hood and roof there were FJ40’s, FJ 45’s and FJ55’s. There must have been 30 that crossed the stage. There were also examples every Corvette ever made. Like old Porsches, early Vettes are all coming out of the barn to supplement Social Security payments. It’s just a really good thing that we didn’t all get attracted to British sports cars years ago, we’d never get to retire. Every venue we attended had at least one Fiat Jolly, all looking like the surrey with the fringe on top with cane seats. Even Russo Steele had one parked out in the dirt under a tent. These limited use vehicles have been bumping up against $100k and that means a $20k payday for a few minutes on the block. Not a bad gig. The parking lots could’ve been car shows themselves as bidders drove to the auctions with their best rides. We saw McLarens, Ferraris, and all manner of Mercedes. 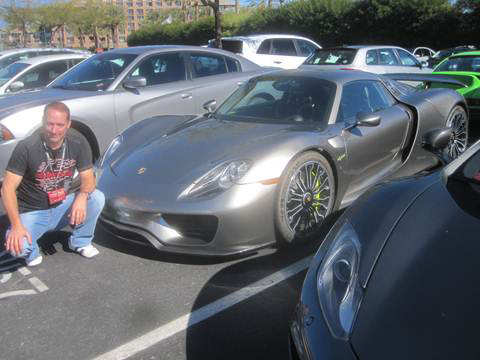 One lot even had a new Porsche 918 parked at the curb. It was drawing as many people taking photos as the cars destined to be sold. speculators are not the buyers that are running the prices upward. Our advice has always been the same, buy the car or cars that you want to drive and enjoy. If it goes up in value, great. If not, you have enjoyed a great ride. Reminder! Motor Cities Gruppe Annual Dinner Socializer on February 16th at Leon & Lulu.